In demographic terms, anthropology in the United States continues to be dominated by white Americans. Consider this graph of the racial distribution of anthropology doctorates over the last twelve years (incidentally, the NSF had no data for 1999, so there should really be a gap year inserted here, but I trust you can all manage without one). The enormous top segment of this graph shows the very large fraction of new U.S. anthropology doctorates that go to white Americans. 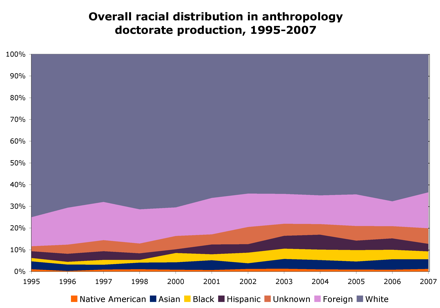 This decade, on average, 65.7% of new anthro phds were white. And yet we also observe that this dominance is falling, slowly, over the years; you can see that here visually. 75% of new anthropology doctorates went to whites in 1995 but only 63.6% in 2007. And other minority groups have grown, slightly, as demonstrated by the widening of those bands that indicate black Americans, Hispanics, and Asians (which includes Pacific Islanders in the NSF-supplied data I use). But racial equity is far from attained.